This week's Prompt comes from the lovely guest star Jess Moyer. Jess lovev card making and is lucky to work with two fabulous design teams. She designs for Just Imagine/Kreaxions, which sells innovative and high quality punches. 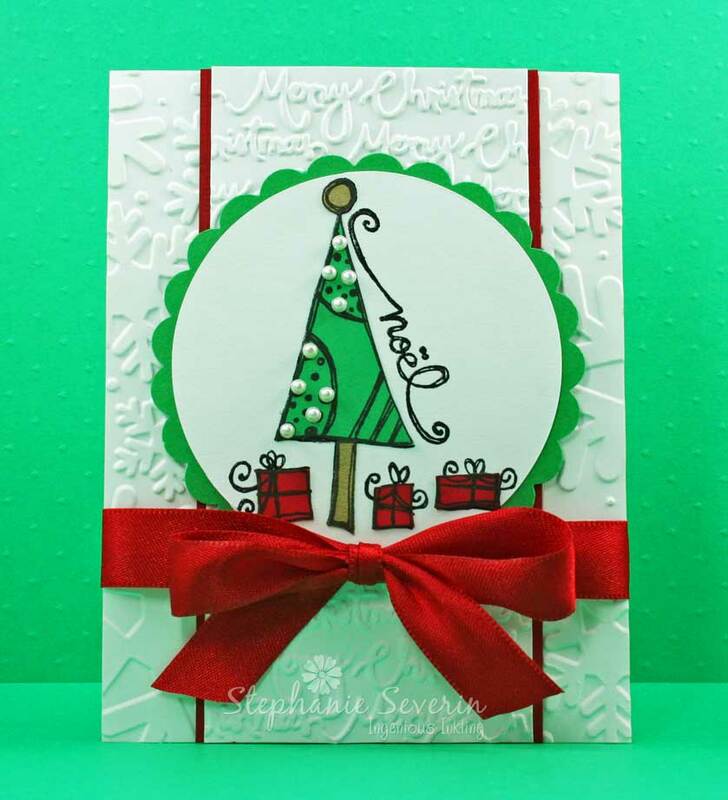 She also designs for Die Cuttin Divas, which is a weekly challenge blog that encourages you to use any die cutting machine (manual or electronic) to complete the challenge. She also enjoys scrapbooking & you can find her fabulous creations at her blog, Basic Jess. So for this week's prompt, Jess thought it would be fun to create cards with ... are you ready ... no designer paper. 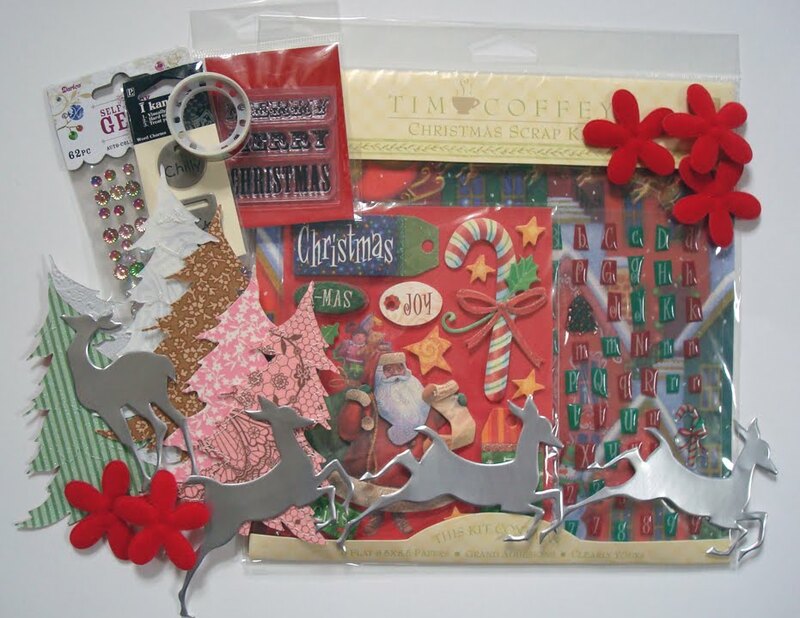 Jess said, "I've loved playing along with Jingle Belles and each week looking through my Christmas crafting supplies I realized I have lots of random embellishments that I bought during after Christmas sales that don’t necessarily match up with patterned paper, but I still adore. 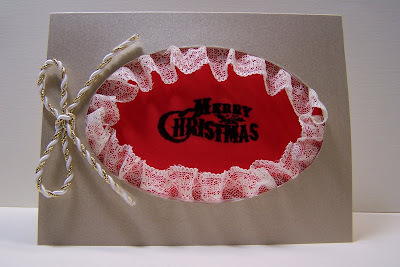 So I thought why not make a card with just embellishments and no patterned paper and my challenge was born." I realize this prompt may be outside of some of our comfort zones (it certainly was for both Lauren & me) ... but one of the fun things about creativity is pushing your boundaries and seeing what you can make. 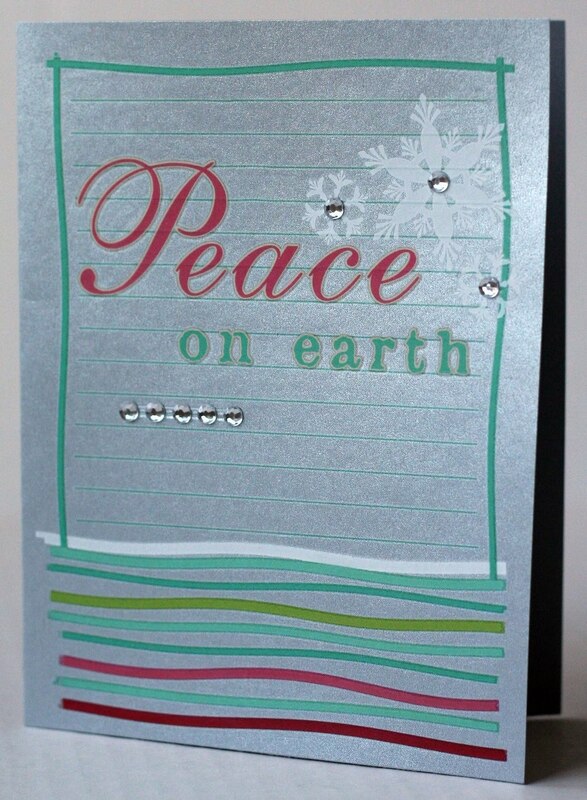 So break out the cardstock, rub-ons, embossing folders, and embellishments ... and show us what you can make ... with no designer paper. Jess says, "Looking through my Christmas embellishments, I decided to play with these May Road rub-ons, which I have a hard time using with patterned paper because of the color palette. 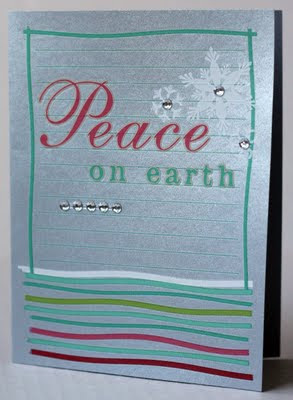 I thought they would really stand out on the silver cardstock and added some gems from Studio 18 to accent the rub-ons. 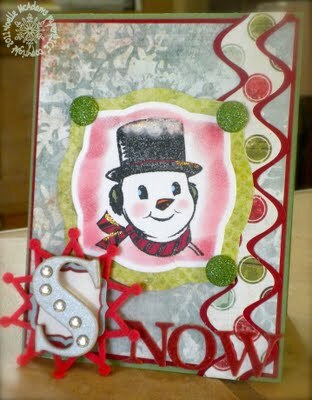 The background, sentiment, and snowflakes are all separate rub-ons combined to create the design of the card." Stef says,"I decided to go digital this week with Hero Arts Season's Greeting Collage printed on blue textured cardstock. I added colored pencil to some of the elements, punched snowflakes, and touches of glitter on the berries & the star on top of the church." Lauren says, "after an absence of color, the most difficult papercrafting challenge you can ever give me is the absence of patterned paper, which is why i *LOVE* jess' prompt so much... it really pushed me to be creative without my usual dependence on lots of designer patterns! this is actually a re-worked version of very first all-cardstock card i made for a core'dinations-sponsored caardvarks challenge in december of 2008 (it's the last card in this post) for which i tore layer after layer of green cardstock (some of which i adorned with the typed lyrics of 'o tannenbaum') and then cut out trees from my 'handmade' paper. this time i used c-bug dies & e/f's as well as some snowflake stickers AND their backing sheet, but i think both versions are pretty cool." So put away those designer papers this week ... and get creative with cardstock. We can't wait to see what you create. 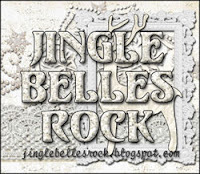 Use keyword JB18 if you upload to a gallery including our Jingle Belles Flickr Gallery. And, our lovely guest star Jess will be giving one lucky participant in this week's prompt a package of holiday rub-ons. kathe says, "i love Carol's card because first of all, that little penguin is so darn cute, but furthermore, everything on the card all coordinates so well - i don't think anyone could ever guess any of it is re-used or re-purposed!" kathe says, "on the other hand, we could possibly guess that cute white fabric trim on Leslie's card was re-purposed from somewhere, but how unbelievable is that - a SOCK! i'm still in awe!" 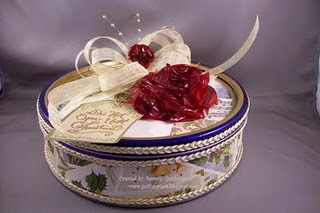 kathe says, "Beverly G didn't make just a card, that tin is AMAZING and her cellophane roses are totally inspired! what a fabulous way to re-use something that (i don't think) can be recycled!" many thanks to *EVERYBODY* who played along! we hope you'll continue to look for cool ideas for crafting in green and responsible ways; not only is it good for the earth, it's quite a boost to creativity, as well, judging from the spectacular cards that came in this week! we hope you've had a chance to scroll down and check those out! extra special thanks to kathe d for being our lovely guest star this week! remember, there are lots of lovely cards to see on both her flickr photostream and her stampin' up blog, and we feel confident you'd enjoy seeing them! this week we have a very special--and totally appropriate--prompt to inspire your christmas card-making! but first let us introduce the lovely guest star who suggested it: kathe deck has been jingling along with us since our debut on january 1st! 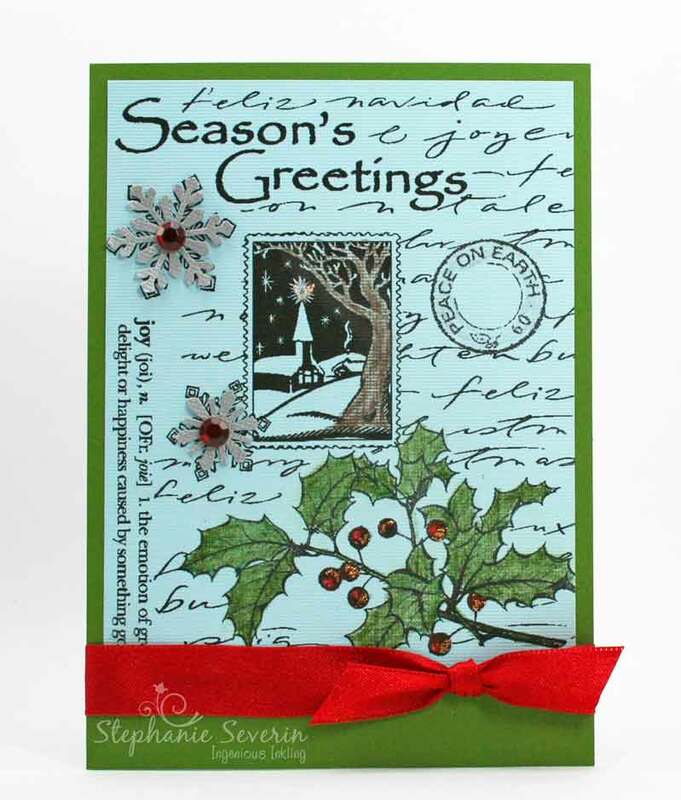 she is a fabulous cardmaker, clever papercrafter, and stampin' up demonstrator. 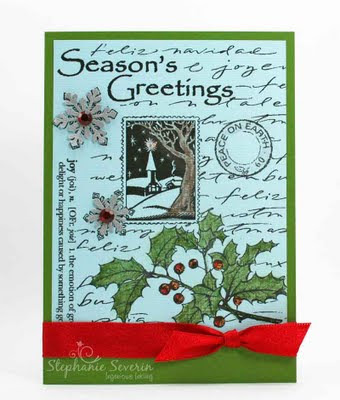 you can visit her stampin' up blog and her flickr gallery to see more of her wonderful work! kathe's theme idea was inspired by the junk mail she received one morning at her office; she threw away (recycled) the innards, but the envelope was red vellum! she had to take it home, thinking "It would be good for something...oh, it would be great for a Christmas card... wouldn't it be really great if the Jingle Belles gave us reuse/recycle theme? Maybe they'd tie it to Earth Day or something like that..." since we actually hadn't thought of that yet, we are thrilled she sent it along! kathe says, "for my card i used the red vellum that inspired me to begin with; i also found an old report bound in brushed gold which i used for the card base. i used a scrap of chipboard cut in an oval shape as a template to cut the opening (i kept the template for re-use another time, too) then glued on the inside some lace trim salvaged from an outfit i sewed YEARS ago for my daughter. the lace and vellum are held in place inside the card with a piece of white card to give the stamped image (from the retired Stampin' Up! set Yuletide Christmas) a little more contrast. since i cut the oval off-center (let's just say 'i meant to do that'), i added the bow using trim i've had in my stash a few years." Stef says, "Who knew having a cold could lead to artistic inspiration. When I finished my box of Kleenex with Vicks & Lotion, I discovered the entire inside of the box was covered in silver metallic chipboard. 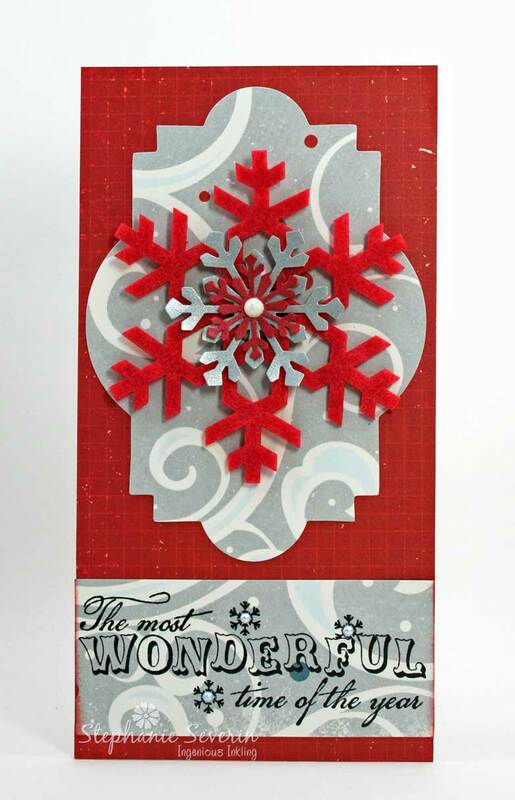 I recycled the metallic chipboard by embossing it with snow flakes & punching out a scalloped circle for my sentiment ... here's to stuffy noses! Since we're "going green" this week, I designed my card in greens." lauren says, "i wanted to see how many re-purposed items i could work into one card, and the answer turned out to be, 'quite a few!' the reindeer is die-cut from an empty soda can (instructions here! ); the snowflake is rescued from a store-bought xmas card i received in december; the ribbon was off a gift i got over the holidays; everything else, except for the kraft background, is from my scrap box! i am a very proud--and very GREEN--belle right now!!!" and now it's time for the very best part: to see what ♥YOU♥ will do and what sorts of fabulous goodies you will "rescue" in honor of earth day in order to: re-cycle, re-use... and JINGLE! as usual, inlinkz will be open until 6pm (EST) next wednesday (4-27) and the keyword for flickr or SCS is JB17! 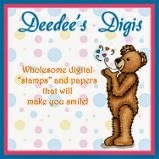 What a happy week here on the ♥JINGLE BELLES♥ blog! We've been busy little bees checking out all of your wonderful designs, and we're delighted to see the amazing cards made by the Honeybees over at Betty Bee's Buzz! Here are a few cards that we thought used diecuts in especially clever ways in honor of our "Jingle Belles are Buzzing" prompt! 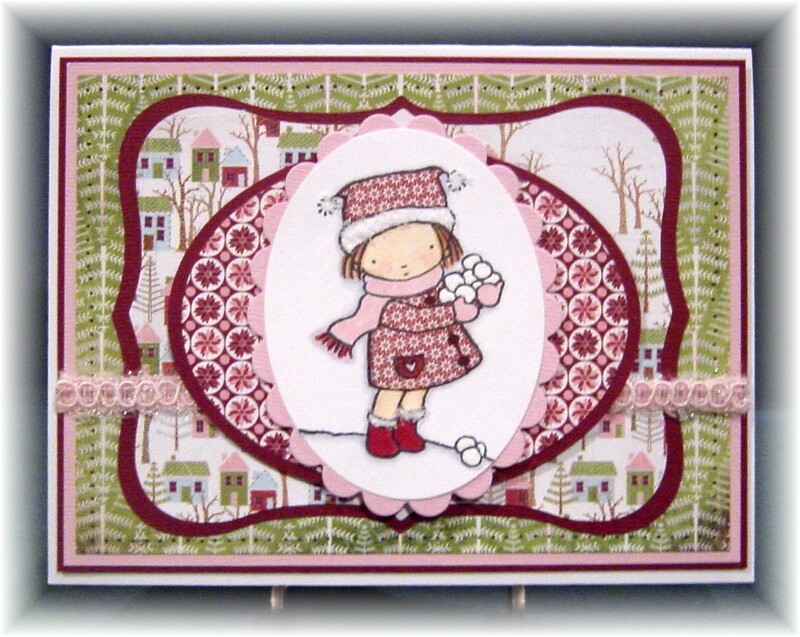 took one adorable stamp, a few simple dies, and lots of lovely layers, to make her very pretty and appealing card! combined multiple patterns, lots of texture, and a heaping helping of ♥FUN♥ in her totally festive masterpiece! 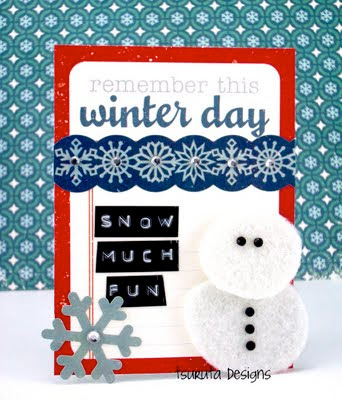 used just a few products in super-creative ways to make her utterly unique and totally happy snowman card! Thank you very much to *ALL* of you lovely belles who played along; and extra special thanks to June Houck, Betty Brett, and the rest of the Honeybees over at Betty Bee's Buzz for "cross-pollinating" with us this week! 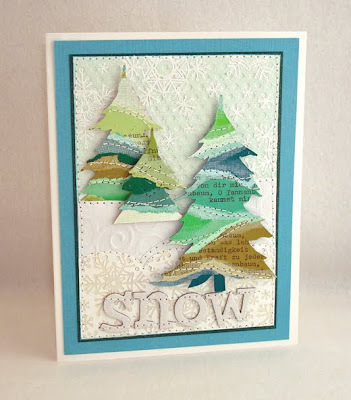 Remember, you can still link up your diecut-laden holiday card creation on their site until 6pm (EST) TONIGHT (Thursday, 4-21) for a chance at a lovely prize that the Honeybees are awarding to a random card-maker! And don't forget that each and every Friday their super-fun "Buzz, Brag and Bee Happy" feature invites you to link up ANY proud creation or bit of good news you'd like to share with the blogiverse, so why not stop over tomorrow and make some new friends! Speaking of PRIZES and random card-makers, we have a little bit of a *SURPRISE* for you: some spur-of the-moment goodies we'd like to award this week... just BEE-cause! and invite her to email us at jinglebellesrock @ hotmail [dot] com with her snail mail address in order to claim this lovely prize! if you've not done so yet we strongly encourage you to spend a bit of time seeing your fellow ♥JINGLE BELLES♥ work with diecuts, and also that of The Honeybees! then come on back at midnight when we'll reveal a fabulous prompt... set by one of your fellow belles! 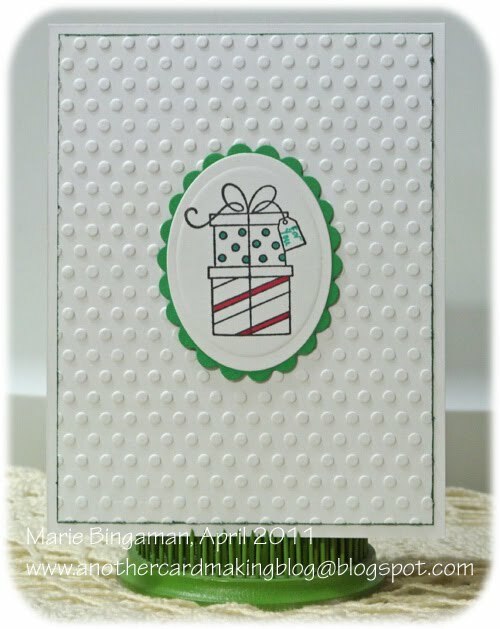 Make sure you click on over to Betty Bee's Buzz to check out Lauren's to DIE for card & leave her a little Jingle Belles love. YES! Because this week we're having a "cross-over"! Betty Bee's Buzz is a super-fun paper-crafting blog hosted by Betty Brett and her lovely swarm of Honey Bees! Their weekly features include Monday Motivational which inspires us with a new idea, technique, or theme; HoneyBee Showcase on Wednesdays in which the design team create projects that fit the theme (& invite us to, as well); and the awesome Buzz, Brag and Bee Happy Friday in which everyone, everywhere is invited to link up a project or post that makes them happy or proud! 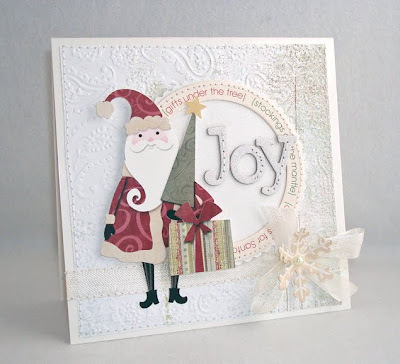 We're happy and proud to welcome HoneyBee design team member June Houck to share her card today, while Lauren--and her card--will be the featured guest on B3 this coming Monday Motivational. 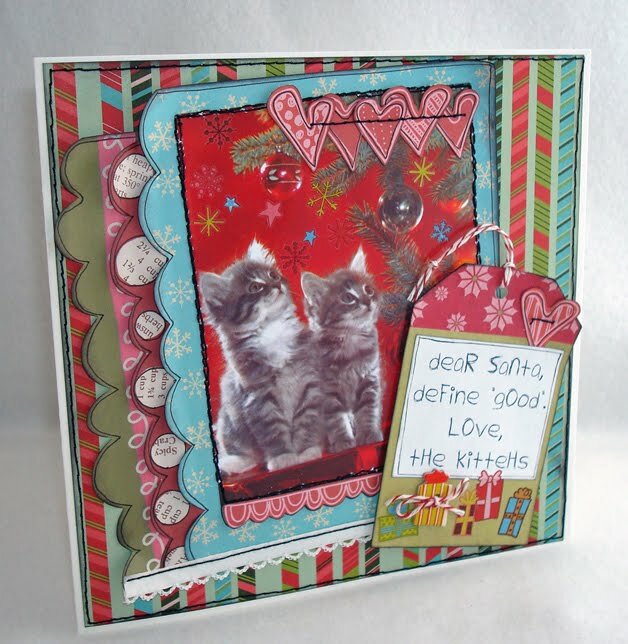 June Houck is a fun and fabulous scrapper and cardmaker, as well as mom to the cutest twin daughters you have ever seen! 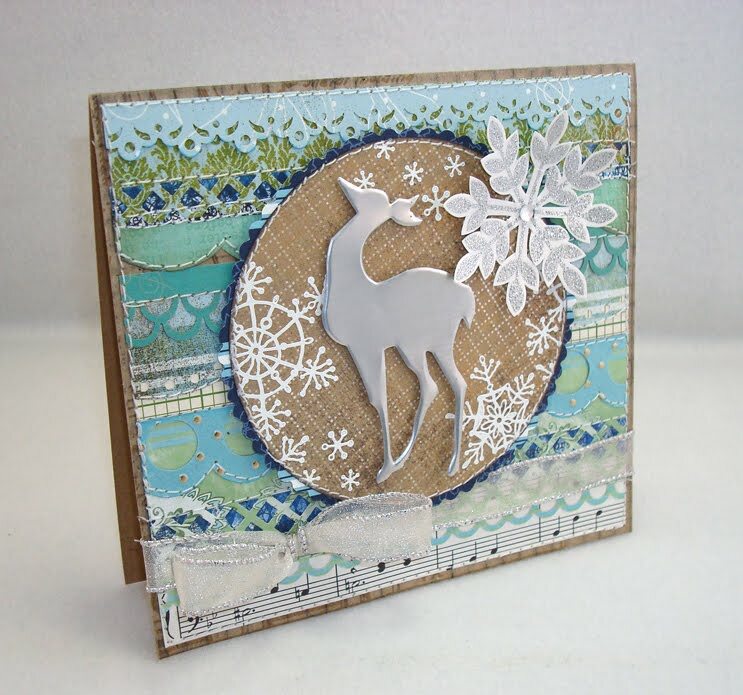 Her blog, Simply Elegant Papercrafts, is constantly full of beautiful, clever, C&S design goodness, and if there's a more friendly and supportive blogging friend around, we have yet to meet her. June says, "Blogging is an outlet for me to share my passion and meet people that share in this obsession. I have made some good friends! I love these ladies as much as the friends I can see in person. My blog friends are a wonderful source of information regarding ideas, the latest trends, where to go for new purchases, and organization of supplies." On behalf of Betty "Bee" and my HoneyBee sisters, I think you for this opportunity to "cross-pollinate" with the Jingle Belles, Stephanie & Lauren. 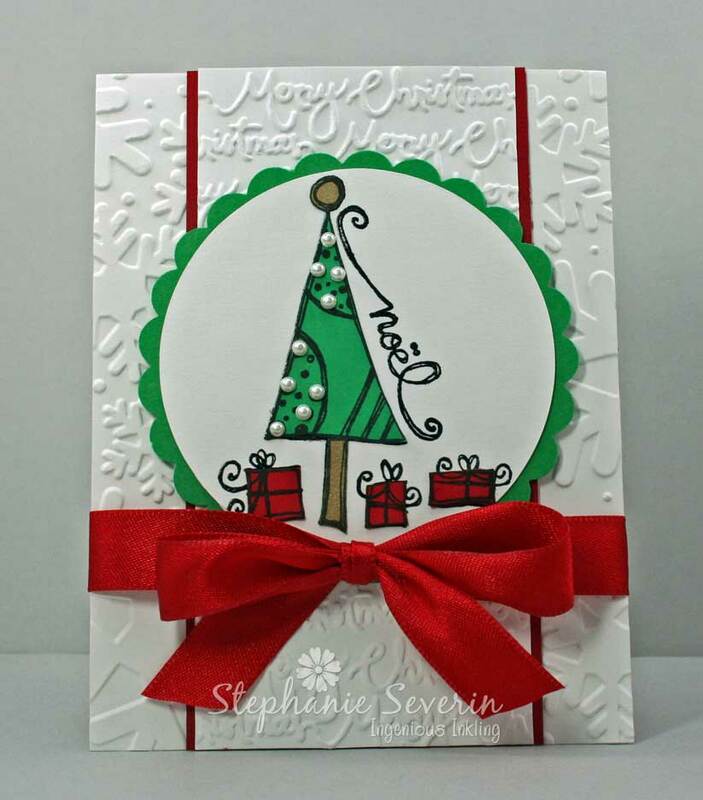 Create a Christmas card to die (cut) for! This week we're featuring *DIECUTS* in our cards. They can be store bought, mechanically made (a la cuttlebug), electronically generated (think cricut or spellbinders), or... if you're feeling ambitious... all of the above?! BasicGrey "Eskimo Kisses" is one of my favorite collections. I like to layer light, dark, light, dark; e.g. my image is light, so I chose the darker BG paper for the oval beneath her, the light paper of the houses and trees, and then the darker pattern of trees. I also wanted my card to be a scene of sorts: the girl and the snowballs, then the houses behind her, and the forest behind the houses. I agonize over these details, so I am a very slow crafter." 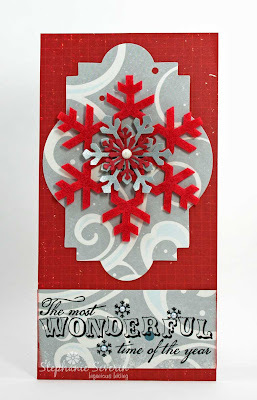 Stef says, "I knew I wanted to feature these wonderful felt die cut snowflakes from Stampin' Up. The gorgeous red one coordinated with these lovely papers from Echo Park's Wintertime Collection. 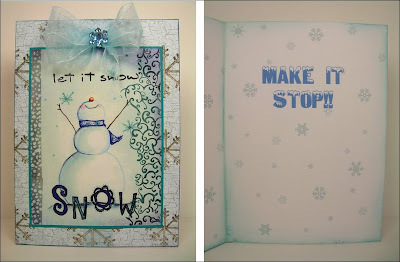 I layered on a few more metallic snowflakes and positioned my snowflakes on top of a die cut from Sizzix - Frame Back, Ornate #3. I finished with a winter sentiment from CatsLife Press." Make sure you also remember link up your card at Betty Bee's Buzz on Wednesday, April 20th. We've enjoyed another fabulous week here on the ♥JINGLE BELLES♥ blog! We love how everyone used the "recipe" to cook-up some fabulous holiday cards. A big thanks to Clare for our wonderful prompt this week. Here are a few especially clever ideas that we thought interpreted this week's prompt, Ghost of Christmas Present, exceptionally well. different embellishments, and of course that gorgeous crocheted lace. thank you very much to *EVERYONE* who played along; and extra special thanks to Clare of Misacanthus Crafts for being our lovely guest star this week! if you've not done so yet we strongly encourage you to scroll down to the thumbnails in the last post and spend a bit of time seeing your fellow ♥JINGLE BELLES♥ in action! then come on back at midnight when the NEW prompt goes live! the ghost of christmas present! 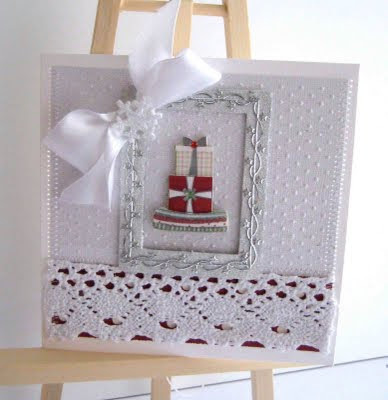 clare says, "I have always been a crafter and moved to card making at very difficult point in my life (which I’m sure a lot of you can relate to). Fortunately, I’m one of the lucky ones and after lots of treatment for I’m out the other side. Crafting makes me smile and when I joined the Craft Bubble forum it opened a whole new door, not only did I make lots of new friends, this was when I started joining card making challenges! Over at the forum there is a little group which I’m part of called ‘Craft Mad and Loving it’ we have weekly fun challenges, and I now run a Christmas card challenge along with a couple of other members, why not come and join the forum! The next step in my crafting journey was blogging and my blog is called Miscanthus Crafts. I’ve have had lots of guest designer spots, been part of the DT at Pear Tree designs and I’m lucky enough to be joining the Bah! Humbug! Christmas challenge team for the month of May." clare has set us a "recipe" this week, of things to include in our cards. Clare says, "When I cooked up this recipe I was thinking lots of white and probably no designer papers. 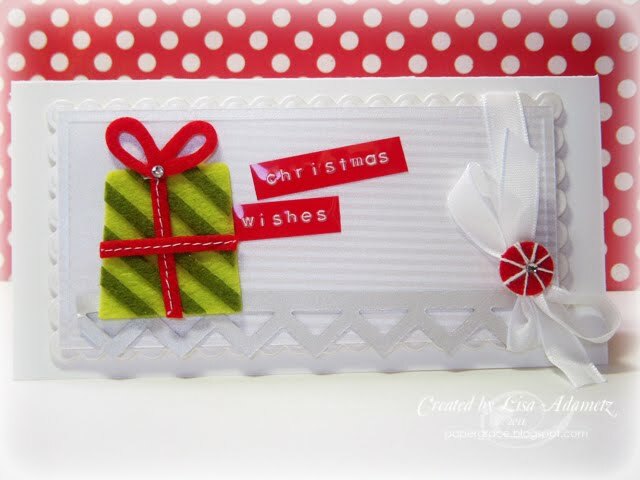 But as you all know us crafters go off on a tangent as our creative juices start to flow and my card design does indeed have some backing papers with cute Christmas colour dots. I have gone with a fairly clean and simple design using a border embossing folder to create some texture on the layering. The cute little present stamp was a freebie off the front of a magazine and I have coloured the image with Promarkers. To emphasize the bow element I decided to paper piece the image using coordinating papers." Stef says, "My layout is from Chupa's Saturday Sketchbook. I paper-pieced this Noel image from Magenta that had never seen ink ... that's one of the things I love about making one holiday card a week is that I finally have time to ink up my neglected stash of holiday stamps. 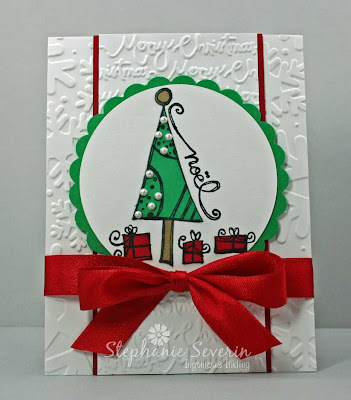 I combined two different embossing folders on the background for texture and finished with white pearls to decorate my tree & a big red bow. " Lauren says, "you won't be surprised to hear that i was waaaaaaaaay of my comfort zone this time, but that is why i *LOVE* getting suggestions for prompts from all over--it's so much more FUN! 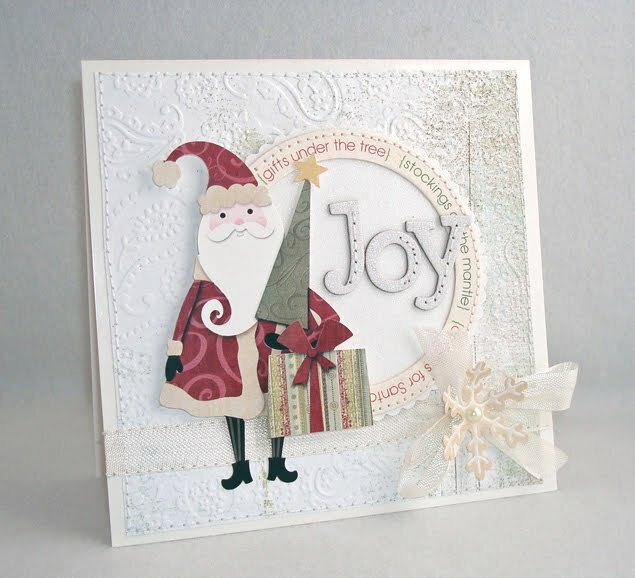 i went with lots of different shades of white... loads of texture... and threw in a jolly santa to "deliver" my present!" and now it's time to see what *YOU* will do: whip up a lovely & spirited christmas card using clare's clever recipe, and "haunt" inlinkz by 6pm next wednesday, april 13th. the keyword for linking at SCS and flickr is JB15. We Love You, No Foolin'! combined a beautiful design we love... and a funny sentiment we heartily support! has it ALL going on with this adorable card... and self-composed verse ...inspired by her dear husband! could not find an image to accompany her own original joke... so SHE DREW this charming scene to illustrate it!!! Thank you very much to *EVERYONE* who played along; and extra special thanks and congratulations to those for whom this was the very first try at a humorous card! We are always massively impressed by how many of you are willing to jump out of your "comfort zone" and take a walk on the wild side with us! We hope you had as much fun with it as we did! If you haven't already figured it out by now, Lauren & I have parts of our personalities (particularly our senses of humor) that are stuck in the stages of pre-adolescent silliness ... it keeps us from taking life too seriously. 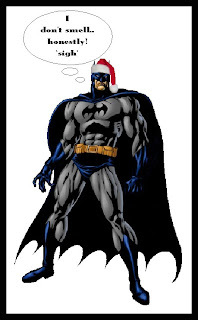 So yes ... this week is Jingle Belles, Batman Smells ... we're asking you to make a humorous card for the holidays. It can be a bit twisted, silly, or just plain laugh-out-loud funny ... just incorporate some holiday levity into your design. Stef says, "My card uses digital paper-piecing with the fabulous Stella from Bugaboo Stamps. 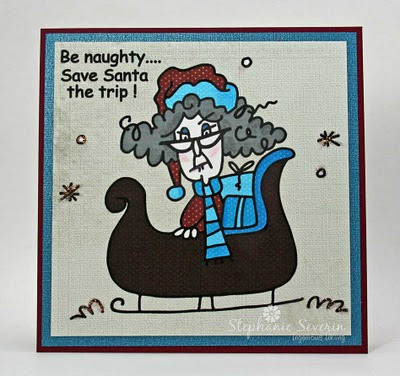 She's always got an attitude that makes me chuckle ... click on over to my blog if you want some tips on digital paper-piecing." Lauren says, "two of my all-time favorite things being vintage card ingredients and the LOLcats, it didn't take long to settle on a photograph from an old ideals magazine converted into a fusion of both! :) a computer-generated funny sentiment, loads of "love elsie" goodness, and a bit of stitching later, i was ready to ROCK our special april fool's edition!" So show us your best silly April Fool's holiday card creations ... we're ready for some giggles. Link up by 6pm EST on Wednesday, April 6, 2011. Use keyword JB14 for SCS or our flickr Gallery.